Can You Install Tile Over Vinyl Flooring? Cutting out a step when installing flooring is enormously helpful. This is why many people want to know if you can install ceramic or porcelain tile directly onto vinyl flooring, without first removing the vinyl. In some cases, you can do this. But as a general rule, it's best to remove the existing vinyl first or simply cover it with a layer of cement board, which is the standard underlayment for floor tile. Not all vinyl flooring is suitable for receiving tile directly. The best candidate is fully adhered (glued down) sheet vinyl. You can also tile over vinyl tiles that are glued down if none of the tiles are loose or curling up. Do not consider laying tile over perimeter-glued sheet vinyl or tiles that are damaged or pulling up. Most luxury vinyl planks are not suitable for tiling over because this flooring typically is laid as a floating floor, with no adhesive. Because of this, the planks are easy to remove and possibly reuse somewhere else. As with any floor tile installation, the subfloor and joists making up the floor structure must be in good condition and have minimal flexing and deflection. Soft, thin, or damaged subflooring or undersized joists can flex too much, leading to cracked tile and grout joints. If the subflooring is thin and lacks stiffness, one remedy is to install new plywood subflooring, followed by thin cement board. Conventional wisdom and good sense say that all floor installation works best when the existing floor covering, even vinyl, is removed. There are a few reasons for this. Layering builds your floor's total height even higher. Since vinyl flooring is so thin—12 mm at its thickest—this is less of an issue than with laminate, engineered wood, or solid hardwood. Still, it is best to avoid extraneous layers. To install tile over vinyl, it's best to have sheet vinyl flooring, not square tile or plank vinyl. Because sheet vinyl is one continuous piece, you will get a higher quality installation without the ceramic tile on top shifting. With vinyl tile, the possibility of shifting is greater. Also, you cannot tile over a cushioned vinyl floor, even if it's sheet vinyl. The vinyl flooring itself may not be installed in a manner that would allow ceramic tile to go on top. Check to see if only the edges of the vinyl floor have been attached to the subfloor. Sometimes, nails, adhesive, or staples are the only attachment the vinyl has to the subfloor; that is, there is no adhesive in the middle. You will gain a higher quality tile-on-vinyl install if the entire vinyl surface is solidly attached with a complete layer of adhesive. 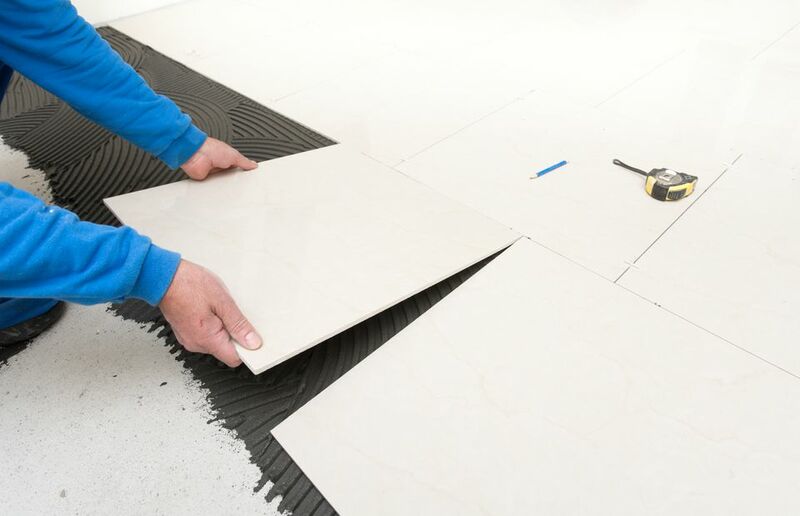 Paradoxically, if you have a perimeter-only attachment system, it becomes that much easier for you to do the correct thing: Pull the vinyl and start your tile installation on a fresh base. It is relatively easy to remove and dispose of sheet vinyl attached only at the edges. If your vinyl meets the basic requirements and you've decided to tile directly over it, there are few things to do to get ready for the tile. After the vinyl surface is prepared, install the tile using standard thinset tile adhesive. Check that the subfloor and underlayment total at least 1 1/4 inches. Tile, mortar, and grout bring significant added dead weight to your flooring system. This means you will need a hefty substrate that will have minimum deflection. Have the flooring tested for asbestos by sending a small sample to an asbestos testing lab. If the test indicates any amount of asbestos, do not proceed with sanding the floor. Thoroughly clean the vinyl with plain water, and let it dry. It must be free of dust, dirt, and any oily residue. Lightly sand the vinyl flooring with a rented flooring disk sander. This creates some "tooth" for the tile adhesive to bond to. If the floor is small enough and you do not mind getting on your knees, you do not need to rent a floor sander; you can use a power hand-sander, such as a random orbit sander. Clean the vinyl with plain water again to remove all sanding dust. While not strictly a tile-on-vinyl method, adding a layer of cement board does eliminate the need for removing the vinyl, and it creates a much more reliable surface than the vinyl. The only downside is that you are adding yet another layer, and thus height, to the floor. To minimize the additional height, use 1/4-inch-thick cement board designed for floor tile. Clean the vinyl floor thoroughly with TSP or TSP substitute to remove all dirt and soap and oil residue. Apply thinset tile adhesive to the vinyl, using a notched trowel. Lay cement board sheets into the thinset, and fasten the sheets with cement board screws driven into the subflooring. Leave a gap of 1/4 inch along all walls and between each of the sheets. Cover the joints between the cement board sheets with self-adhesive cement board joint tape. Do not use standard drywall joint tape. "Mud" over the tape with thinset adhesive, filling the gaps between the boards and smoothing the thinset with a drywall knife or a trowel. Let the thinset cure completely before laying the tile.